What Is Happening With Real Estate Contracts? If you are thinking about selling a home in Tallahassee, you will want to keep an eye on the quality of real estate contracts for homes like your own. You see, not all real estate contracts are created equal, and the quality of what is in writing very likely will determine whether or not you get your home sold. Before you brush this off as trivial, would it surprise you to find out that just 1 in 3 real estate contracts makes it to closing and the trend is on the decline? 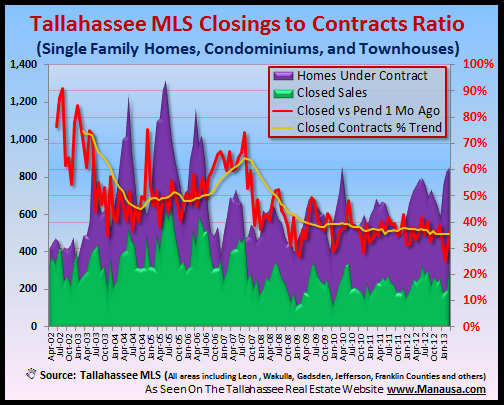 We monitor the trend of home sales recorded to real estate contracts written in the Tallahassee MLS, and the ratio of these two measurements is at its lowest level in more than 11 years. If our records went back further, I suspect the level would be at an all-time low. In the real estate graph below, new contracts are measured in purple while new sales are shown in green. The red line is the monthly ratio of "sold listings to pending listings" and the yellow line is the one-year trend of this ratio. The simple fact that you should understand about writing better real estate contracts is that it is a developed and developing skill. The single smartest thing you can do when you buy a home or sell a home is to hire the right real estate agent. While experience is worth its weight in gold, every year we see changes in our real estate contracts. Thus working with an experienced real estate agent is not always going to be enough, you need to be working with a highly productive, well trained, experienced real estate agent. Any agent who is full time should be selling 18 or more homes per year, and you can simply make that part of your interview process to have them show you their sales for the past 12 months. There is so much to be gained (or lost) during the negotiation, and real estate contracts are the form we use for the negotiation, so make sure you have the best. to give you an edge on the competition. Thank you Dwight; we like to give our customers an edge in the market, and mastering this contract is just part of the package.